Hi there! 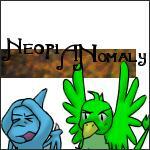 We are Ellie (oobajooba) and Nev (neveahsgates), and we are Two World Travelers. We've been all over this world, and have discovered some pretty cool things along the way. Come with us as we illuminate some of the most wondrous items and our favorite aspects of each special Neopian land. In honor of the Gadgadsbogen Festival, today we're taking a look at the best Mystery Island has to offer. In no particular order, here we go! There was a time many moons ago when the amazing land of Mystery Island was locked to those Neopians who did not have a special totem with which to gain access to the Island. The Aisha Totem was used for this very purpose. However, as a throwback to the past, you can still find totems around Neopia. If you are lucky, or, depending on your point of view, unlucky, you may find one of these forgeries, and you can smile and reminisce about the old days. What a wonderful place for your pet to stand: right there in front of Mystery Island's most iconic land mark - the head statues! Always have a record of the amazing moment with this background! On your trip to the Island, why not take in some of the traditional music? If you are lucky, you will find a pet who can teach you how to play this classic pipe! These beautiful flowers can be seen growing all over Mystery Island. With their lovely heart shaped petals and leaves, they are perfect to give to a loved one on Valentine's Day or to that special someone at any time of year. Here's another example of the botanic wonders of Mystery Island. These particular flowers are so pretty that someone decided that they should be forever preserved as a plushie that will never droop and requires no water whatsoever! You can see Island pets all around Neopia, and Mystery Island is full of them. Take your pet for a dunk in the Rainbow Pool with this and not only will they look stunning, but they will forever be reminded, and remind you, of the holiday of a lifetime. This is one of the most expensive prizes to be won from the famous Tombola that you can visit once daily on Mystery Island. Most of the time you may get junk from there, but it's definitely worth a play; this particular item goes for hundreds of thousands of neopoints. Besides that, it's really pretty too. This is another throwback to the older days of Mystery Island. It was to be found in the Haunted Woods to help the Tiki Tack Man. If you wanted to, you could dress up to scare your pet. I mean... the Tiki Tack Man's not the best looking guy, is he? Jhuidah is the faerie that looks after Mystery Island and her cooking pot. This beautiful snowglobe celebrates her. It will last a long time, preserving those memories of your visit. There is another side to Mystery Island - Geraptiku. This is a dark, scary, possibly haunted place. The Lizark hails from this place. It is one of the cutest things you'll find. And even though it comes from such a scary place, it will make a great companion for your pet! The food of the gods. It would be impossible to make without the Mystery Island Cooking Pot. Thank you, Jhuidah and the gods of Mystery Island. Each Neopian world is home to unique fauna. In the case of Mystery Island, you'd want to check out the Rock Pool for aquatic petpets or make your way to Geraptiku for something more feathery and less fishy. The Flippy is mentioned here because it is one of Mystery Island's most ancient and noble petpets. Before they were retired, one used to be able to travel to Mystery Island to see the hatching of the baby Flippy in the spring and watch as they crawled to the sea for the first time. The Doughnutfruit is a rare Mystery Island delicacy. For those who can afford it, this is one meal you and your Neopet DON'T want to miss. It is also available in several flavors and varieties. Make sure to check out the local marketplaces for the freshest picks! This item can only be won from Mystery Island's famous Tombola. The Tombola is a popular site that many Neopians visit daily. Who wouldn't want to greet that jolly Tombola Man every day? While the Tombola Coin comes in many varieties, we feel that the Chokato Tombola Coin is the one to have. Chokato and Tombola are as integral to Mystery Island as sand (which they conveniently sell bottled) and sea. Like the Doughnutfruit, Chokatos are a versatile ingredient in many Neopian creations, including inedible ones like the Tombola Coin. Ellie and I know that you can't always take us with you to show you all the cool stuff about the places you're visiting. Thankfully, Mystery Island has put out its own authoritative publication to guide you around. It's almost as good as having us right there with you. Codestones are small, shaking stones that are particularly valued by Mystery Island training gurus. Without them, your Neopet would be stuck going to Cap'n Threelegs on Krawk Island, and they'd be unable to train past level 40. They are iconic Mystery Island artifacts. I mean, even the Island Rock wants to be one! It's not called "Mystery Island" without reason. If everything about it could be explained, there'd be nothing mysterious about it. So why is this rune glowing? No clue. But that's why you should have it: it epitomizes the "Mystery" in Mystery Island! You want to brag to fellow Neopians about your amazing four week vacation on Mystery Island during the chilly Month of Sleeping but you're not quite sure how to bring it up without sounding pompous? Bring this sculpture home with you for the perfect conversation starter! For those of us who can remember back into the Dark Ages of Neopian history, Gadgadsbogen was an elaborate puzzle to be solved in addition to a festival. The Fruit Bomb was one of the prizes given out to those who completed it. Why is this prize worth mentioning over the others? Nev is more partial to the Twirly Fruit than the Flotato, the Carnapepper, the Blobbule, or the other fruits the prizes were based on. What better way to spend the afternoon with friends than with a picnic on The Beach? Complete with authentic mat and island-appropriate gear, you could even have a festive Mystery Island picnic indoors on Terror Mountain! We hope you've enjoyed exploring some of the wonders of Mystery Island with us! Tune in next time to see where we're going!